Recently I've been exploring walking foot quilting on the Janome Horizon Memory Craft 9400 QCP and have been loving the results! When you talk about quilting your projects, most people think that you are talking about free motion quilting, but that isn't always the case. You can get great results by using your walking foot to do your quilting. In one of my previous blogposts, I showed my readers how to make a no binding self-metered placemat, perfect for setting your table or for gift giving. If you haven't read this blogpost yet, you can read all about it here. I quilted the centre of these placemats using my walking foot and I was thrilled with how quick and fun it was to do! I chose to do a wavy design both vertically and horizontally on the project. This was so easy as I really couldn't go wrong with this type of design. I started by stitching a wavy line vertically in the centre of the placemat and then continued to stitch wavy lines on either side of it. Once I was finished stitching in this direction, I repeated this process horizontally. I didn't mark my lines, but just eyeballed the distances between each line. There are just so many possibilities with this simple quilting design. To see how I quilted the placemat, just click on the image below to watch a video on my YouTube channel that provides more information. 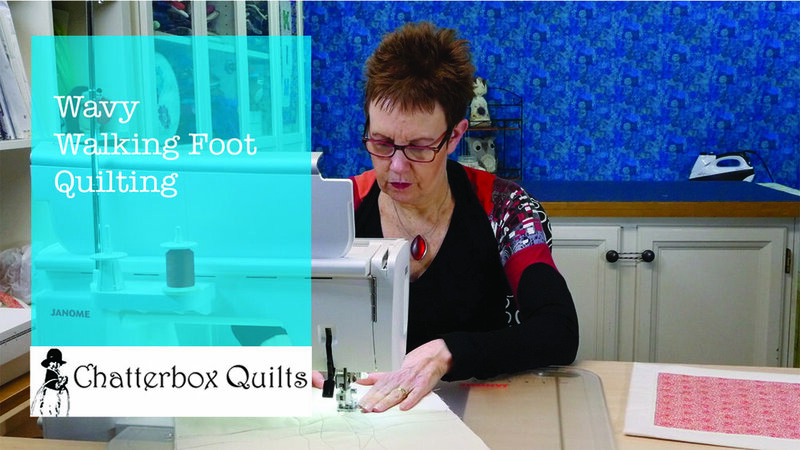 Do you use your walking foot to do your quilting or do you prefer to free motion your quilts? Have you tried wavy line quilting with your walking foot? Leave me a comment below to let me know. Did you know that you can sign up to receive FREE emails full of quilting goodness? Just click here to receive FREE content directly in your email inbox every few weeks from Chatterbox Quilts. I know you'll be glad you did!